We recommend that children see an orthodontist for the first time at the age of 7 because by this time, there is a mixture of baby teeth and adult teeth starting to come in. It sounds early, but it’s the right time for our orthodontists to check your child’s bite and detect any issues that might benefit from early treatment. In most cases, no treatment is necessary at this age. However, some signs that may call for early treatment include overlapping teeth, difficulty chewing, speech problems, thumb-sucking and mouth breathing. Orthodontists are trained to control the bones in our faces to grow together properly, so there is symmetry between the upper and lower jaws. We want to guide your child’s jaw growth to minimize the chances for needing future surgeries. Children can have an overbite or underbite at a young age that influences their jaw to grow more on one side than the other when they get older, which can lead to TMJ pain. Your child’s early orthodontic problems can lead to bigger problems in the future. Untreated orthodontic issues can lead to protruding teeth, speech impediments and tooth decay due to poor brushing and flossing. 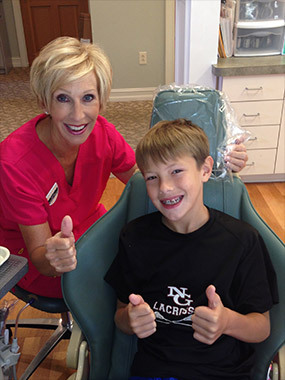 Our orthodontists want to do what we can to ensure that your child doesn’t have orthodontic problems in the future. Even if your child doesn’t need treatment at an early age, parents often take comfort in having a professional confirm that everything looks normal. When no treatment is necessary, we simply will continue to monitor your children as they grow to determine if treatment is needed and if so, the best time to begin it. Call our office to schedule a consultation with our orthodontists to discuss the first steps toward a lifetime of healthy smiles.